Motor proteins are involved in a number of biological processes within the cells and tissues of biological systems. They exist in several different forms and are involved in muscle contraction, construction and deconstruction of the cytoskeleton, and intracellular transport. 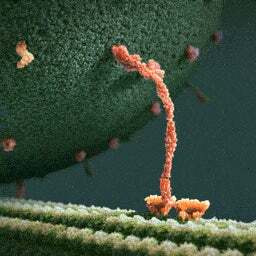 The proteins currently being examined have a biped structure and walk along the cytoskeleton pulling organelles and nutrient packets along as cargo: the picture to the left depicts kinesin in this role. These proteins have a size on the order of nanometers so it difficult to observe their dynamic behavior. Modeling and simulation can be used to attempt a prediction of the details of motor protein dynamic behavior that are difficult to observe.